This is a spruce tree (scientific name Picea). Today spruce grows in as northern Minnesota, northern Wisconsin, and northern Michigan and most of Canada. However, 16,000 years ago it was growing throughout much of the midwestern U.S. south of the glaciers. Much of Illinois and Missouri was probably covered with an open spruce parkland. We know that spruce was present in these areas because we find its pollen, logs, needles, and cones preserved in the sediments from mires, lakes, and ponds throughout the area. Spruce logs are found frequently in mire, lake, and loess deposits in much of the midwestern U.S., including Illinois. The section of spruce log pictured above was found in a borrow pit in Morton,Tazewell County, Illinois. 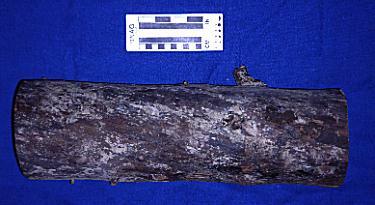 The Illinois State Geological Survey obtained two radiocarbon determinations on this log. These yielded radiocarbon dates are 20,020 +/- 230 (ISGS-2047) and 20,720 +/- 490 (ISGS-2048) years before present. The log was recovered from the Morton Silt. The Morton Silt is a loess unit occurring throughout much of the area. In the borrow pit in which the log was recovered the Morton Silt is overlain by the Delvan Till Member of the Wedron Formation. This till is a mass of sediments deposited by glaciers during the height of the last Ice Age. The log is part of tree from a forest that was overridden by glaciers during the last major glacial advance in central Illinois, approximately 20,000 years ago. This grain of spruce pollen is from Nelson Lake, Kane County, Illinois. It is approximately 13,000 years old. ISM Curator of Botany Dr. Eric C. Grimm is studying the pollen from Nelson Lake. Research, such as Dr. Grimm's work at Nelson Lake, is leading to an increased understanding of the vegetation and climate history of Illinois. The spruce grain in the image is greatly magnified. A spruce pollen grain such as the one illustrated is about 100 microns long. Two types of poplars, balsam poplar (scientific name Populus balsamifera) and quaking aspen (scientific name Populus tremuloides), are present in this reconstruction. Pollen from both of these trees has been recovered at sites in the midwestern US. Today these two species are common in the boreal and Rocky Mountain areas of North America. The pollen grains in the image are greatly magnified. Populus pollen grains such these are about 30 microns in diameter.